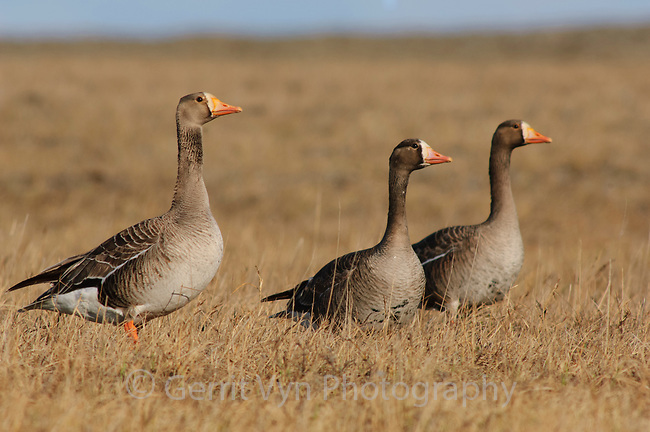 First summer Greater White-fronted Geese (Anser albifrons) of the subspecies A. a. frontalis exhibiting Basic I Plumage which resembles adult plumage but is not as boldly or brightly marked. Shows narrower white forehead than adults and has less extensive or no dark ventral markings. Birds do not exhibit characteristic (adult) dark belly speckling/barring, until after their second summer. Arctic Coastal Plain, Alaska. June.